This guide explains how to write OS image to the Pigeon computer eMMC storage. Download and run the rpiboot_setup.exe to install the drivers and boot tool. Plug your host PC USB into the Pigeon USB DEVICE port. Apply power to the Pigeon and Windows should now find the hardware and install the driver. LED ACT should be on. Once the driver install is complete run the RPiBoot.exe tool that was previously installed. LED ACT should turn off. After a few seconds the Pigeon will pop up under Windows as a disk (USB mass storage device). Use Win32DiskImager to write OS image to the drive "boot". Once you have written an OS image make sure nothing is plugged into the USB device port. 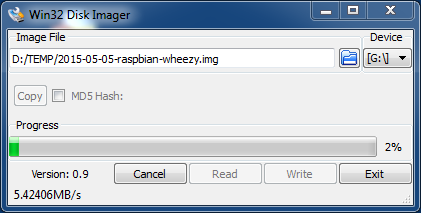 Login (user:root, password: kristech) and enter the command "raspi-config", select "Expand Filesystem", exit from raspi-config. Apply power to the Pigeon and the rpiboot tool will discover the Pigeon. You will see a new device appear. This is commonly /dev/sdb but it could be another location such as /dev/sdc, so check in /dev/ before You will write OS image.